VW's Polo-basd Vento sedan is shown hanging from a New Delhi building during its 2010 launch. 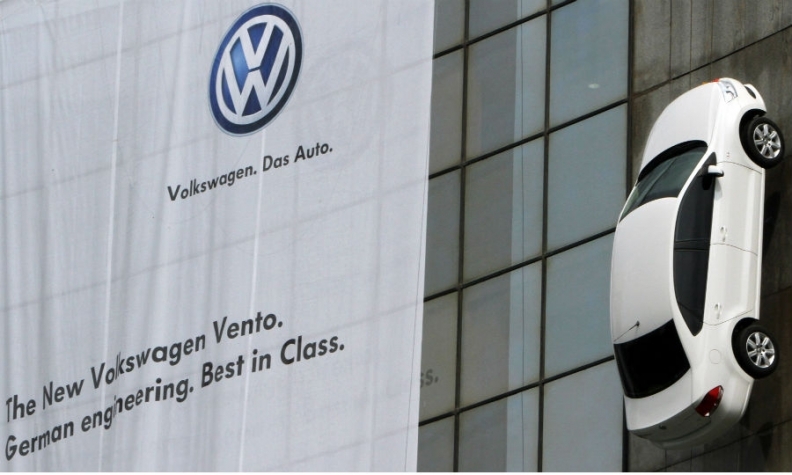 NEW DELHI (Reuters) -- Volkswagen Group will recall 3,877 Vento sedan cars in India after tests by Automotive Research Association of India (ARAI) found that the emission of carbon monoxide was sometimes exceeding the threshold limits. Volkswagen Group India will also temporarily stop sales of the Polo-based vehicles that have a 1.5-liter diesel engine and a manual tranmission, the company's local unit said in an emailed statement today. "Volkswagen India is analyzing the issue and will propose technical measures to ARAI to solve this inconsistency at the earliest," it said in a statement. However, the problem is not connected to Volkswagen's global emissions issues, the company added. Carbon monoxide is a toxic substance emitted by vehicle engines when they are unable to fully combust the hydrocarbons contained in fuels. "Once approved and confirmed by the competent authorities, Volkswagen India will implement the measure and resume the production and sales of the relevant vehicle," the company said.